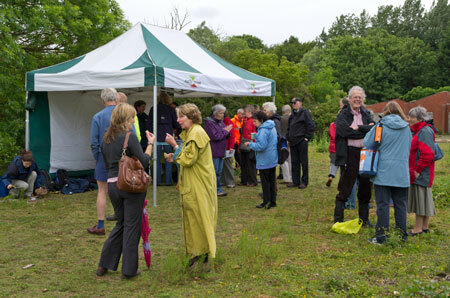 At a lakeside ceremony today, the circular walk around Thrupp and Bullfield Lakes, was officially opened by Graham Scholey, chairman of the Earth Trust, Jim Haggan, Manager of Didcot ‘A’ Power Station and Archie Eyres a pupil of Radley Primary School, who cut the ribbon. 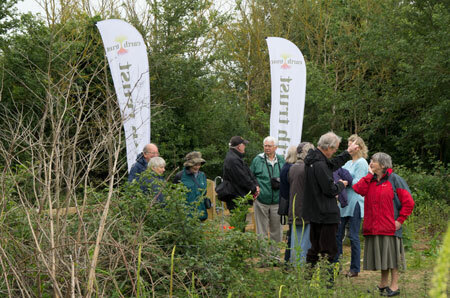 As part of improving public accessibility to the area around Thrupp Lake, the Earth Trust, who manage the site on behalf of RWE npower, for the benefit of the community, has made a walkway completely encircling both Thrupp and Bullfield Lakes. The 1.6km walk includes a permissive path across the area west of Bullfield Lake, consented by the landowner, Mr John Curtis, without which complete encirclement of both lakes would not have been possible. 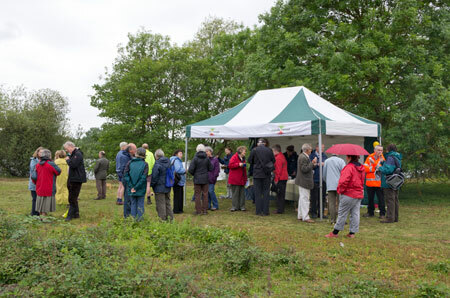 Clearance of the site and construction of the path has involved hundreds of man-hours of work, much of it carried out by volunteers from the local community. 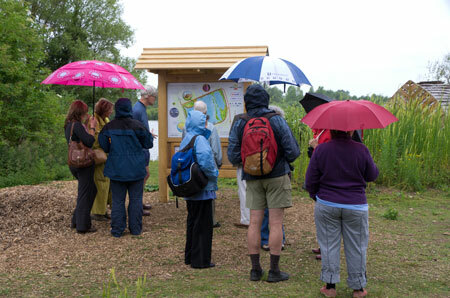 The cost of the boardwalk, bird hide and signage was split between RWE npower and South Oxfordshire LEADER, and the boardwalk also had a contribution from COMMA[pdf] funded by the DEFRA aggregates levy. Along the route of the new path, visitors will encounter a unique lily shelter, a boardwalk across one corner of the lake and a bird-hide with a ‘green’ roof as well as astounding views across this beautiful lake, now a haven for many species of wildlife. 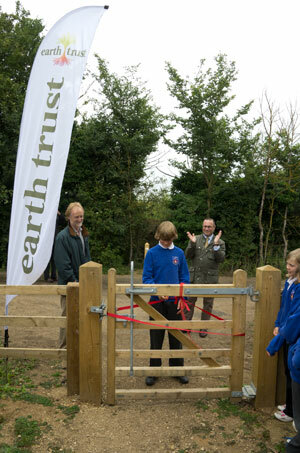 Today these facilities and the walk were officially opened to the public at a ceremony attended by representatives from local councils, RWE npower, LEADER, and the Earth Trust, a contingent of children from Radley Primary School, and invited members of the public including many who were involved in the 2005-8 campaign that saved the lake from destruction. The weather forecast for the day was certainly not promising. The weather began dry but rain soon began to fall, becoming steady just as the main ceremony proceeded. However it seemed to go unnoticed as speeches about the value and importance of the site, and its past and future, were made and applauded, and as the ribbon was duly cut, in several snips, by Radley School pupil Archie Eyres. The children then played wildlife croquet, in the rain, and (hopefully) enjoyed the setting for a short while before returning to the school. Meanwhile, the rain fizzled out and remarkably held off until after the day’s events had concluded. 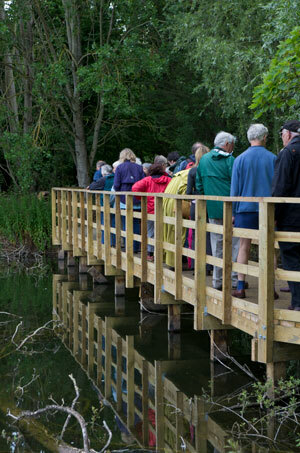 Guests were able to enjoy a guided walk around the lakes in the dry. Notable encounters included several bee orchids in bloom and a lime hawkmoth resting on a twig just above the water at the corner of the lake. The following is a photographic record of the day’s events. Guests gathering for the event, while tea is brewed on a wood burning stove (hence the smoke). 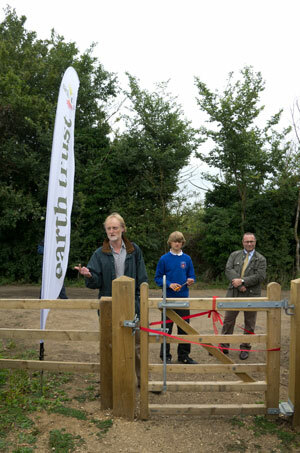 Graham Scholey, Chairman of the Earth Trust (Left) with Archie Eyres and Jim Haggan (Right) conduct the official opening of the lakes walk. Archie Eyres cuts the ribbon. while other guests, seemingly heedless of the rain, chat among themselves. 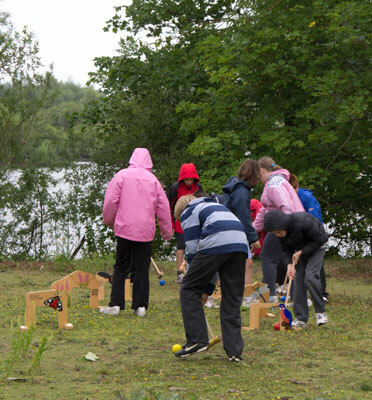 Above: Chaotic croquet being played, in the rain, by pupils of Radley Primary School. Above and below: Wildlife croquet it may surely be: croquet never got wilder than this! to enjoy the refreshments provided in the dry. Above: Frog’s eye view of the wildlife croquet ‘hoops’. This game was the popular choice of pupils (and teachers) of Radley Primary School Thames class and is playable by all ages. 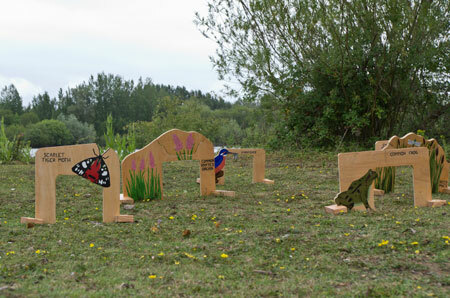 The wooden hoops are attractively adorned with illustrations of some of the wildlife found at the lake, and some of them have ingenious flaps and doors to add interesting twists to the game. 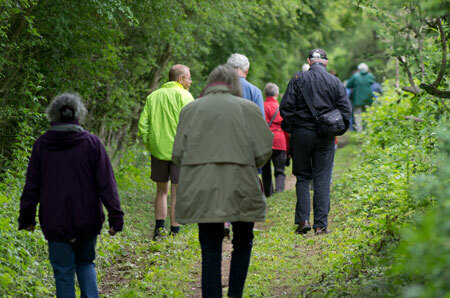 … and eventually returning along the byway south of the Bullfield.